I believe in service. I persuade, cajole, and cheerfully push young people to do good works. And I teach and live that working with others to solve social problems makes you happy. 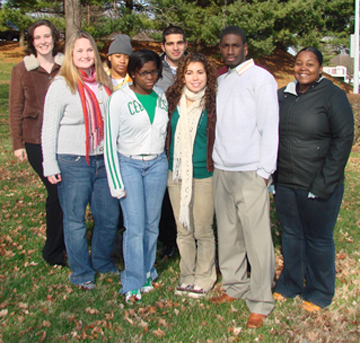 Member, Centre College Bicentennial Committee. Mentor, Brown Fellows classes of 2016 and 2017. - This is Centre's top scholarship. Fellows are supported for summer enrichment projects, and (together with their counterparts at the University of Louisville) study aspects of Kentucky in order to be good representatives of the commonwealth. Advisor, Alpha Phi Omega, a co-ed service organization. Past President, Phi Beta Kappa chapter (Beta of Kentucky). Advisor, Badminton Club (since the late '90s). I was mentor to the first cohort of Posse Scholars, a leadership scholarship for a diverse group of mostly first-generation college students from Boston. I was advisor to Centre Democrats in the '00s. I was pre-law advisor in the '90s. And anything to do with diversifying Centre. I am an elder of The Presbyterian Church of Danville (PCUSA), where I regularly teach Sunday School. I was a Commissioner to the General Assembly in 2014. I served on the Task Force on Changing Families, which result in this document (2004). I served on the Task Force on Higher Education. I worked on the Re-Forming Ministry project. I have served in a number of offices and commissions of Transylvania Presbytery. In Danville, I organized a group including the city, the county extension office, the community foundation, and ordinary citizens to seek a series of matching grants from Kentucky Utilities to plant trees on the main streets of town. I have published over 100 book reviews, mostly in Choice, the magazine of the American Library Association.